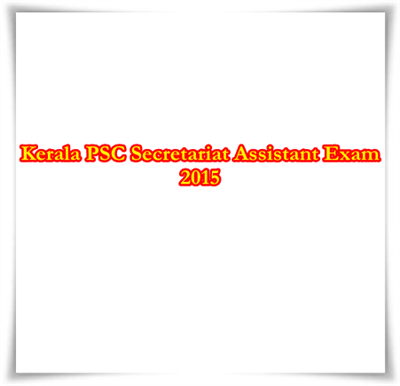 Kerala PSC Secretariat Assistant exam 2015 notification & syllabus will be published in December 2014. Being one of the major test conducted by the Kerala Public Service Commission, the Secretariat Assistant exam is being held once in 3 years. As per the process, the Kerala PSC will notify for the secretariat assistant post through their official website. The notification includes the application method, qualification to apply for the written test, and last date for application. Getting a job with the Kerala government is the dream of millions of job seekers in the state. Secretariat Assistant is such a job which will give recognition and respect in the society. The exam is being conducted to appoint selected persons in the major organizations in Kerala which include Government Secretariat, Public Service Commission, Local Fund Audit, Advocate General's Office and Anti Corruption Bureau. The promotion scope, growth, authority and power attract youngsters to this job. As per the promotional hierarchy, one can become the Section Officer and finally reach up to the top level Special Secretary. From the post of section officer, he becomes a Gazetted Officer, a desirable Government position which is being viewed with reverence and awe. As the Kerala PSC has decided to publish the notifications of important post once in 3 years, the Secretariat Assistant Notification will be published in December 2014. The exam will be conducted during the months of May and June 2015. As the validity of the present rank list ends on 7th April 2016, a new rank list will be published on the following day. Only 272 candidates got appointed from the previous rank list of Secretariat Assistant. The deduction in the appointments is due to the reduction of Secretariat employees' deputation and promotion acquired by typists as Secretariat Assistants. The secretariat assistant exam is meant for candidates who have passed any of the graduation courses from any of the recognized universities in Kerala.The details about the additional qualifications will be in the new notification publishing by the Kerala PSC. As soon as the notification gets published in the web portal, candidates need to submit the application through the one time registration process. Much effort is needed to achieve best mark in the exam. As it is a degree level examination, the question paper will have tough questions from the deep portions of the syllabus. Getting a balanced coaching from the nearby centres will motivate the candidates. Reading newspapers, rank file of Secretariat Assistant exam, text books of Social Science, Science and Mathematics up to class 10, referring previous secretariat assistant exams question papers and browsing the internet would give better result while in the exam hall.